FAYATTEVILLE, N.C. — Former St. Louis Cardinals left fielder, Lou Brock, has been named the keynote speaker at Cape Fear Valley Diabetes Health and Wellness on Nov. 1, 2014. The diabetes event will be from 10 a.m. to 1 p.m. inside the Cape Fear Valley Education Center. Brock will speak at noon. Source: Fayobserver.com. 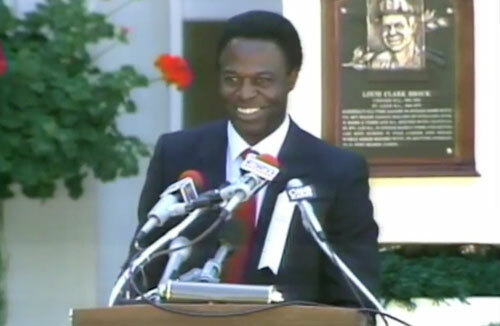 Photo shows Lou Brock speaking at his Baseball Hall of Fame Induction in 1985. Brock, who is now 75, was diagnosed with type 2 diabetes at age 60. He now shares his experiences managing the disease through diet, exercise and other means. Other scheduled speakers include endocrinologist Nduce Onyeaso and Sid Scruggs, past president of Lions Club International. Brock is a former MLB player who spent the majority of his career as the left fielder for the St. Louis Cardinals. He was best known for breaking Ty Cobb’s all-time major league stolen base record. Brock was inducted into the Baseball Hall of Fame in 1985. He is currently a special instructor coach for the St. Louis Cardinals. Sports Speakers 360 is a booking agent for pro athletes. If you would like to book Lou Brock for a speaking engagement, appearance or endorsement, contact Lou Brock’s booking agent for fees at 1.855.303.5450.